Nobody’s Going to Sports in Person Anymore. And No One Seems to Care. 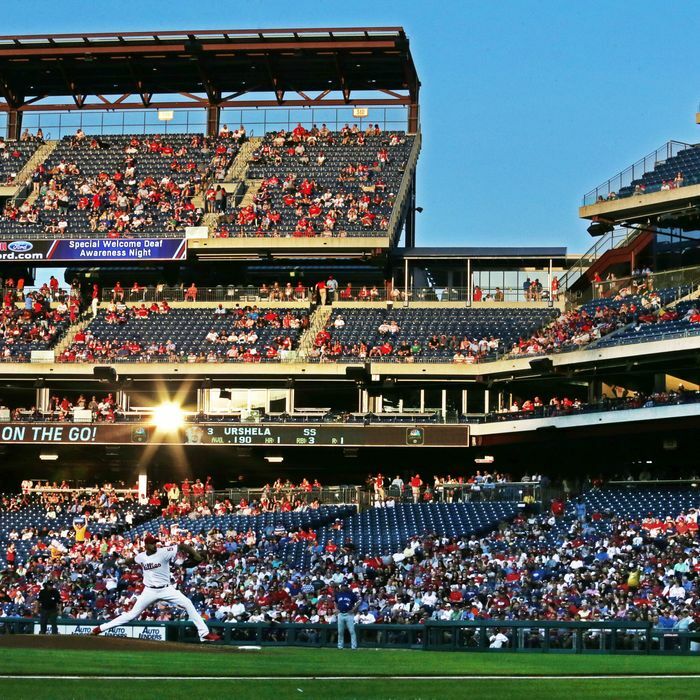 Last month, Major League Baseball commissioner Rob Manfred addressed something that observers had been whispering about the entire first two months of the 2018 season: There were suddenly a lot fewer people going to Major League Baseball games. Last year was the sixth consecutive season that fewer people had attended MLB games than they had before, but the first two months were a steep drop even from the 2017 nadir: A whopping 10 percent drop from the same time period last year. Manfred, at June’s MLB Owners Meetings, noted that his initial suspect for the drop — the miserable weather across the country in April and May — might not have been the only culprit, and that he might consider some schedule tweaks or other remedies down the line. Others have floated several other possibilities, from high ticket prices to the high number of “resetting their competitive window” (or “tanking,” depending on your parlance) to HD television making watching the game at home just as good as the real thing but without the drunk guy two rows behind you to Manfred’s old bugaboo, pace of play. But it is worth noting that Manfred, while concerned, was not appreciably alarmed. Part of this, of course, is for all the talk of baseball’s supposed cultural irrelevance, the game remains popular, still the second-most popular sport in the United States (even among millennials!) and, when you account for total eyeballs in regional markets (rather than the crude national Nielsen ratings for “event” programming the NFL prefers), is probably being watched by more people right now than at any other time in human history. And part of this is because attendance (like TV ratings, for that matter) is down for most sports, from the NFL to the NHL to, in particular, major college athletics. (NBA attendance was actually up last year, for the fourth straight year.) Part of this is because this downward swing was rather easy to see coming and, all told, is still not that dramatic; attendance is still up by more than 17 million fans a year from 1992. But the main reason attendance is down, in Major League Baseball as well as most of the other major professional sports, and the main reason owners and commissioners aren’t sweating it too much, I’d argue, is because it can be. Teams don’t really care anymore about bringing fans to the stadium — at least not as much as they used to —because they no longer need people in the seats to make money. Last year, the NFL brought in revenues of more than $17 billion, and Major League Baseball earned more than $10 billion, records for both sports. An increasingly small percentage of all that revenue came from attendance. The NFL attributes most of its 2017 improvement to a new Thursday Night Football television package and increased media payments from other properties. MLB’s numbers, which grew even more the year before (when its Advanced Media arm spun off into its own company and was sold for $2.58 billion to Disney), came from expanded partnerships, local television ratings, and its own media-rights deals. Attendance has been down each of last seven years in MLB, and MLB’s revenue has been up every single season. Knowing that, how much would you sweat attendance numbers? This has obviously not historically been the case. Attendance used to be the single driving indicator of a franchise’s financial success: It’s basically the reason the Dodgers are in Los Angeles rather than Brooklyn and the Giants are in San Francisco rather than Manhattan; by the end of their time in New York, each was averaging about 15,000 fans in stadiums that held more than twice that. Interestingly, that period, when the country was first watching television en masse, was marked by attendance declines even for the most successful teams: the Yankees lost 7,000 fans a game in the ’50s despite reaching the World Series six times that decade, and it’s remarkable to see how empty Yankee Stadium was the day Roger Maris hit his 61st home run. But it wasn’t just the 1950s when attendance was a struggle. Throughout most of sports history, the only way to keep your franchise was to find some way, any way, to drag fans to the ballpark; Bill Veeck wasn’t the most famous hype man in entertainment history because he thought it would be fun (though it was). He had to hustle. It was then essentially the same problem minor league baseball — or any sport that doesn’t have a television deal — has now: When the turnstiles weren’t moving, you weren’t making any money. That is clearly not the case today. Sure, teams and leagues will still happily take your money for a ticket, don’t worry — but you’re actually just as valuable for them, maybe even more so, as a subscriber to their internet package or even just a basic cable subscriber to ESPN or their in-house network. They don’t need you to show up at the game to get in your pocket. And even as a nostalgic traditionalist, I have to admit, there are some actual benefits to this new approach. The tanking epidemic — where teams deliberately sabotage their short-term chances to cultivate a medium-term talent pipeline — has been a boon to lesser franchises, traditionally unable to even dream of championships, and it has largely blossomed, I’d argue, because teams haven’t had to worry about bringing fans in. The Astros, to take one example, were essentially okay with nobody watching them for three years because they were making enough revenue elsewhere and thus could focus on building for the future. That future just won their franchise their first World Series. It’s no surprise so many teams have followed suit, in all sports. Even the MLS is evolving positively because of its new television contracts. The business plan for the league for much of its first 20 years was to bring in older players from European leagues and use them as gate attractions for the most casual fan, which brought some attendance spikes but at cost of the reputation of the league, which was seen as an American retirement home for past-their-prime stars. But with the recent TV deal, the MLS has a more stable income stream and has, DC United’s desperate embrace of Wayne Rooney aside, started to embrace the long-term model of franchise building, investing in young players and encouraging a solid foundation for years to come rather than quick jolts of empty publicity. The short-term money allowed for long-term growth: that is, after all, how capitalism is supposed to work. The only potential hang-up: attendance issues become a long-term problem rather than a short-term one. The threat, of course, is that, as any of the suckers who work in media can tell you, counting on the state of play in that world to stay stable for any period of time is a fool’s bet. Right now the smart money is in all these media contracts, but any sports fan knows that the true iron of lifelong dedication to a team or a sport is forged from the in-person experience; media will change, but the sport itself will not. You need that kid and to have his or her parent, or grandparent, or whoever, take them to the game and make it a part of their lives forever. This isn’t empty sentiment, either: If sports are just a TV game, they’re really not all that different than American Ninja Warrior, or Battlebots, or (ack) WWE: just television spectacles than can be moved on from simply by changing the channel. Which may be one, small reason why e-sports are now booming. And it does make me a little bit sad. I use a sports memories website called Sports Passport that chronicles every sporting event I’ve ever attended. Each game I’ve been to is its own memory — what great players I saw, who won the game, where I was in my life at that time, and, most important, who I went to the game with. I smile just thinking about them. I don’t remember who I watch games on television with, other than the fact it’s usually by myself. They’re just another piece of streaming programming. Getting out to the ballpark is the foundation of this whole thing. They’re the reason we care in the first place. Teams and leagues might not think they have to worry right now about the fact that fewer people are doing that than they have in recent years. But they should probably start.